Several Phoenix Downs later, the formerly panned MMO is being embraced by players. 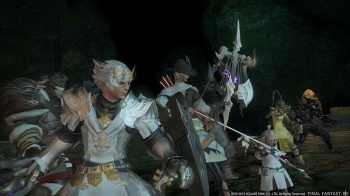 Square Enix put a hefty amount of resources into relaunching its beleaguered MMO as Final Fantasy XIV: A Realm Reborn. Other companies might have just cut their losses and left the game to wither and die, but the Final Fantasy name wasn't one they were willing to walk away from. All that effort seems to have paid off, though, as recent reports indicate that A Realm Reborn has more than 1.5 million registered users worldwide since its August launch. While it's not clear how many of those registered are actively playing the game, with subscription fees ranging between $13 and $15 a month based on payment plans it probably still comes out to a considerable windfall for the company. All things considered, it's a mighty impressive launch for any game, especially considering that Final Fantasy XIV was almost universally criticized at launch. Heck, back in September, even the game's director was surprised at the number of players who were eager to jump into the game.